The Georgetown neighborhood, located in Madison, Indiana, on the Ohio River, became home to African Americans as early as the 1820s. 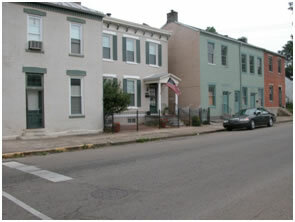 The unique feature about this neighborhood is that the homes, churches, and environment that the freedom seekers, conductors, and abolitionists involved in the Underground Railroad saw still exist today. The Underground Railroad-associated African Methodist Episcopal Church and Colored Baptist Church still stand, as do the homes of Underground Railroad leaders like William and Elijah Anderson. Georgetown, located just five blocks from the Ohio River, became a place in which hundreds of freedom seekers found a community of safe houses and conductors willing to give them aid to reach the next station toward freedom from the 1830s on. The Ohio River is shallow and narrow at Madison, and during the early nineteenth century it experienced seasonal lows. Several deep creek beds draining into the Ohio near the east end of the town lead from the river into rural Indiana, allowing an easy route north. These geographic features made the Madison area a prime location for freedom seekers from Kentucky to cross the Ohio River. Madison could be dangerous, however, as it contained a mix of ardent abolitionists willing to become active in the Underground Railroad and pro-slavery activists wanting to break up this community. Men such as Madison's notorious Sheriff Rea actively sought rewards for returning to slave owners those fleeing from slavery. Colored Baptist Church, also known as the Walnut Street Methodist Episcopal Church (711 Walnut Street), was built in 1839 when 78 members of the Wesley Chapel in Madison split off because white members of the choir took seats originally meant for the African Americans. Several members of the Colored Baptist Church congregation were active in the Underground Railroad and this activity brought white mobs into Georgetown during the tense mid-century years. The number of raids and their violence began to escalate to a point that leaders of the church asked Underground Railroad activists like William Anderson and George DeBaptiste to stop their activities for the safety of the community. This request prompted several members like William Anderson to break off from the Colored Baptist church and form the African Methodist Episcopal Church (AME) which became the site of worship for many of the leaders of the Underground Railroad. After the split, William Anderson built the present AME building in 1849 (309 East Fifth Street) and then deeded the property to three trustees of the church. William Anderson (1811-1867) was born in Hanover County, Virginia, to a free black woman, and was bound to a slaveholder. He recalled having been sold or exchanged eight times. Eventually, he escaped slavery and arrived in Madison in 1836. The brick house (713 Walnut Street) was his family’s home from c. 1838 to 1859. In December 1856, Anderson was arrested aboard the steamer Telegraph using a warrant from Carrolton, Kentucky, accusing him of running off human property. He was tried and acquitted of the charges. Having to sell his home and other property to pay the incurred court costs, he later lived (313 East Fifth Street) next to the AME Church. In 1857, Anderson wrote a narrative of his life, including his work on the Underground Railroad. Elijah Anderson (1808-1861) ran a blacksmith shop on the corner of Walnut and Third Streets and built his 1840 two-story Federal style home at 626 Walnut Street. Because of his light skin, he traveled with freedom seekers to Canada via steamboats and trains, masquerading as a master traveling with his bondsmen. Kentucky citizens placed a $1000 bounty on Anderson’s head. He felt compelled to move from Madison. In December 1856, nonetheless, Louisville police officers captured and arrested Anderson on an Ohio River steamboat for taking a group of freedom seekers from Lawrenceburg, Indiana, to Cleveland. He was found guilty of violating the Kentucky Law against “Enticing Slaves to Run Away,” and sentenced to an eight-year term. Mysteriously, the day Anderson was to be released from a Frankfort, Kentucky, prison in 1861, he was found dead in his cell. The Madison Historic District, is located in Madison, in southeastern Indiana, roughly one hour northeast of Louisville, Kentucky, and one hour southwest of Cincinnati, OH. The Georgetown Neighborhood is located along North Walnut and East Fifth Sts. bordered by Jefferson Street (US 421) to the west and Main St. to the south. A self-guided walking tour produced by Historic Madison, Inc., Indiana Landmarks, and the Indiana Humanities Council is available at the City of Madison Visitor’s Bureau, 601 W. First St., and at Historic Madison, Inc.'s headquarters at 500 West St. The African Methodist Episcopal Church is located at 309 E. Fifth St. The African Methodist Episcopal Church is owned by Historic Madison, Inc., and is open for special events and by appointment. For more information, visit the Historic Madison, Inc., website or contact HMI at (812)265-2967.